A key fob is great promotional giveaway. There are few personalised gifts that are as colourful, useful, long lasting and cost effective as the key fob. So all you have to do is browse through our website and view all of our key Fobs and Key Rings and decide on a design and the quantity, then we'll see that they all reach you ready printed up with your business details and company logo to ensure that you stay advertised at all times. Then you can give away our Key Fibs to your friends and customers and spread the word about your business details. An excellent advertising tool. For prices on personalised key fob call 01989 565281 or complete this quotation form. View other key fob keyrings. There are hundreds of styles and types. 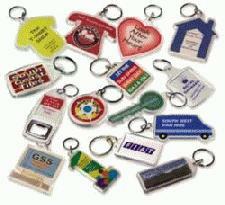 Loop fobs, house shaped keyrings, key shaped key fobs, plastic van keyrings, acrylic keyrings all shapes and colours.